You'll need to log in or create a free account before connecting with a network of people who love all things gaming just as much as you. Discussing all things gaming since 2013. Backstory: Get ready. This is long. 1995. Science had appeared to be on the brink of a breakthrough. The first artificial self-sustaining, thinking, living being would be created. Not much was known about such a delicate and complex procedure, but the idea had been around for ages. Science decided to use a newfound chemical called itatymine (eh-tah-tih-meen), which bounds liquid together like gelatin to hold together a system of organs and a synthetic brain. The brain alone had been worked on for over 20 years, and finally it was ready to be put to the test. The chemical itself had so many atoms packed into it, the electroncs over-repelled the surface it was adjacent to, causing to to hover slightly above whatever it was lying on. When in contact with a magnet, however, it seemed repeatedly implode, like shaking a cup of water up and down. They believed this was the effect of the super-repelling effect from the itatymine coming in contact with a pulling force. It didn't really have much an effect on the organs it held, except that the fine index powder inside of it caused a peculiar refraction of light, making it appear as if the organs were invisible. This was simply light reflecting off the powder and back onto itself, giving it the illusion of appearing empty. Because of the H2O it contained, it gave it a blue tint of a color. Originally, "Project Axus" began as an oval-shaped blob that could stand itself up from electromagnetic repulsion of the surface below it. The brain, after so many years of progress, was later proven to work perfectly. Amazingly, they weren't so focussed on the fact that the first ever artifical human brain was created, they were more concerned on it evolving at such an alarming rate and learning so quickly. It was put through simple tests. It learned to pick up objects with limbs it grew out of either of it's sides. Though strenuous for it, it didn't seem to mind, this probably being becuase he has no muscle to tire out. A ring stacking test was administered months later in the lab. It picked up the metallic ring and appeared to be observing it, feeling it and testing it's resonance (or so it seemed) by tapping it against an adjacent wall. Without full arms, feeling around for objects was a difficult task, but it still proceeded to do so. It picked up a wooden block with a peg sticking out of it and stopped for a moment, surprised at the new shape and texture of this object. The scientists in the other room couldnt help but smile as they watched their creation learn. It...it was really learning. It tapped the two items together for a while, eventually tried putting the ring on it since it discovered the use of the hole, but without eyes, this was also difficult. It persisted anyhow. About 5 minutes later, it finally got the ring on--the scientists were both excited and relieved as they watched it take it off and put it back on the peg with ease. They had done it. 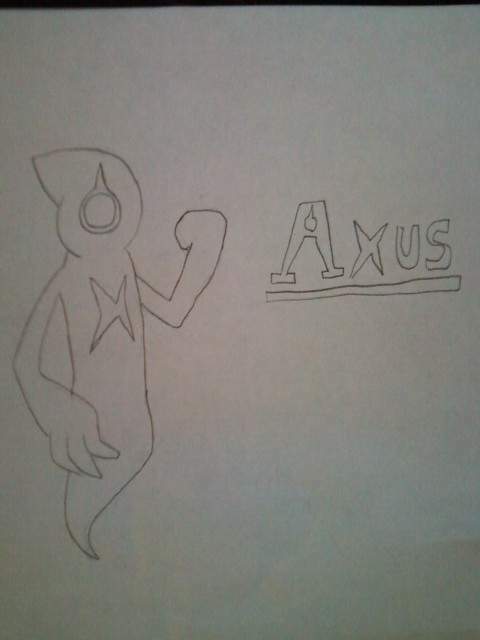 All the work and effort they put into "Project Axus" was becoming a quick success. General Bondeare: What...what is that thing?! I-is that thing alive...?! Dr. Cavertine: ...Yes, general. It is. He's quite alive. Me and my colleagues spent countless time on this special little guy. Err...it appears he isn't so "little" anymore, now is he? We call it, or him, "Project Axus", for now. He doesn't have a literal gender, so we just refer to it as a 'he'. We still have a lot to teach him, but he knows about as much as a 4-year-old human child right now. He lives off of a synthetic brain and a set of organs we've 'built' him with. Project Axus had measured out to be atleast 6 and a half feet tall, looming over the general, curiously looking at him. It had developed an eye of some sort over time. It only allowed him to see in shades of a gradiant blue due to the lack of cone and rod cells in his 'eye'. Dr. Reede: We aren't sure how, but it also seems to be able to hear. We theorize it may be sound waves vibrating the area around his brain, so it knows there is sound, but he may likely not be able to distinguish speech from noise. Dr. Reede snapped his fingers a few times in Axus' direction, causing him to curiously scan the room, eventually spotting the doctor, realizing the noise was emanating from him. Dr. Reede nodded at him with a smile. Dr. Reede: You see? It takes him a bit, but he finds the source. I'm sure Axus will be able to 'hear' more accurately as he ages. General Bondeare: ...Christ, Reede, this can't be legal. The thing has no emotion! It's a damned robot, at most. What if it goes rampant? It will show no mercy, no remorse...it'll just keep going! Dr. Reede: I highly doubt that. He's pretty wary about humans, never once have we been able to get close enough without him shrinking away from us. Testing is pretty difficult at times because of this. Poor thing's a bit scared of us, still. General Bondeare: In any case, you keep that thing locked up. Central Intelligence hears about this and they'll have all of your heads! Hell, probably even mine just for seeing that...thing! Dr. Cavertine: He has a name, General. Our practices may be considered unorthodox, but we do it for the development of future science. Who knows, maybe we'll become famous. Cavertine said this with a smirk and a brief chuckle. Bondeare grunted as he adujsted his collar, exiting the facility through an elevator. Cavertine and Reede headed to their offices, a hint of fear on their faces, masked by false bravado they had implied on the General. Axus looked around the room, poking at the concrete walls. An acryllic-glass pane on the other side of the room caught his attention, as it usually did. He liked watching the outisde world. He didn't know what birds were, but like a cat, he sure loved to watch them. He'd poke at the glass where they would fly by. He wondered what else there was to see, but never once did the idea of breaking out cross his mind. He liked it there, oddly. As wary as he was, he also liked Cavertine. They did share a faint, unspoken bond. This was most likely because Cavertine was the first human he'd ever 'seen', since the day his 'eye' had first formed. Cavertine spent countless nights watching Axus, up until that day. Axus sat (or...so it appeared...) lying against a wall, feeling his palms on the tiled floor. He didn't have thoughts, not yet. Maybe he'd be able to later on in his life, but a synthetic brain has limits. You can't recreate something so complex...like man. You can try, but when it comes right down to it...life is original. At this point in the story, he doesn't have the marking on his torso yet. I hate coloring, but if I had, he'd have a blue-ish liquid-y look. The ring that serves as his 'eye' is a solid, non-translucent, pale plue.